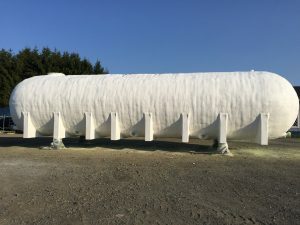 Granby Composites offers a broad array of fiberglass tanks, including storage tanks. These tanks come with many advantages. They are easy and quick to install on top of being 30 times lighter than concrete and four times lighter than steel. 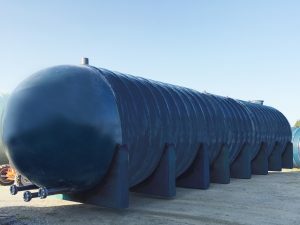 Storage tanks are versatile and can be used, among other things, to supply water to mining sites, for fire protection, sewage treatment and clean water storage. Granby Composites handles the detailed engineering, manufacturing, transportation and installation of all the components of your storage tank. Our products are delivered ready-for-use. Storage tanks are a cost-effective storing solution, and they require zero maintenance. Through the use of fiberglass, a material that won’t rust unlike steel, no seal replacement and no repainting are needed. Fiberglass is also a sturdy and durable material that does not degrade as opposed to concrete. Storage tanks also protect against UV rays. Storage tanks can be installed indoors and outdoors. With isolated tanks, stored liquids can be heated and kept warm easily. There are also non-isolated tanks for other types of uses. No matter where they’re installed, Storage tanks work well in all types of environments. They require minimal installation effort, either on a concrete slab base or crushed stone surface, avoiding the need for excavation into the permafrost or rough ground. Granby Composites carries a large selection of storage tanks ranging from 2,000 to 42,000 US gallons (7,000 to 157,000 litres). Tanks can be connected through communicating vessels easily in order to fulfill important water supply needs. With this type of installation, hundreds of thousands of gallons of water can be held in reserve. Storage tanks are a great storage solution, and this particularly applies to when a site needs a temporary water supply, for instance.